Somehow the stores are gearing up for back to school. Apparently fall is coming? (Someday?) But it’s still 110 degrees in the shade right now and I’m HOT. And so are the kids. Enter: snow cones! 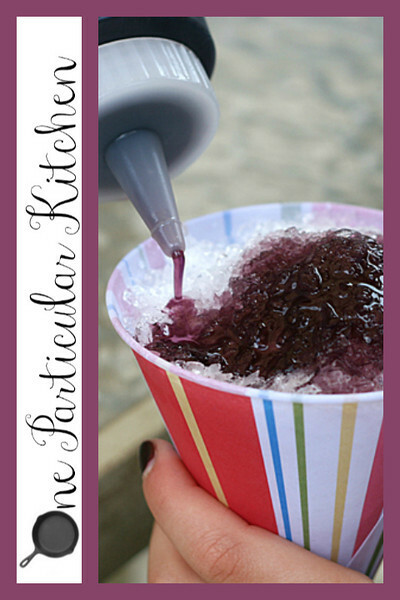 There are a bunch of recipes floating around the interwebs for snow cone syrups so I just picked out the bits that sounded good and came up with this one. Sadly, I do not own a groovy Snoopy snow cone maker, but I do have one of these spiffy blenders that I used to grind ice into little snow cone cups I picked up at Target — mission accomplished! The kids had a great time getting to pour on the syrup themselves, and eating them on the back patio meant minimal cleanup. Go make some!